Centuries of history is being lost due to the mismanagement of Stoke Park, according to one campaigner. Earlier this year, Bristol City Council agreed to buy the land, which they plan to graze a herd of cows on, but it is currently owned by a consortium of developers led by George Wimpey and Barratt Homes. Although the land around the 16th-century former Dower House looks well- tended from the M32, look closer and vandalism, criminal damage and neglect on the estate and ancient woodlands within it are clear for all to see. For Steve England, chairman of the Stoke Park steering group, it is not good enough. Mr England, 42, who works part-time as a teacher and landscape gardener, took the Evening Post on a tour of Stoke Park to highlight some of the key issues. 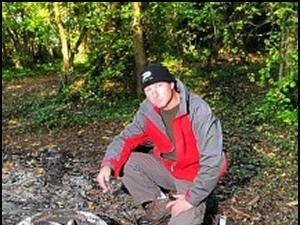 We saw several burnt-out motorbikes, dangerously over-hanging tree branches and the woodland floor almost obscuring historic Victorian ponds and tunnels restored for half a million pounds five years ago. The 140-hectare Stoke Park estate belonged to the Berkeley and Beaufort families for more than three centuries. The parkland estate also carries a Grade II listing but many of the serpentine pathways and monuments repaired after two centuries are again falling into neglect. Matilda’s Tomb, grave of Charles Somerset (1709-1756), 4th Duke of Beaufort, so-called because he owned a Derby winner called Matilda, is covered in graffiti and surrounded by a rickety fence. Mr England saved the most shocking example of neglect until last: the grave of Elizabeth Somerset, who died, aged 81, in the Dower House in 1828. The once majestic monument, positioned with commanding views over Bristol and the River Frome valley, now has graffiti scrawled all over it, is surrounded by broken glass and the stonework is loose. “Stoke Park has massive historical value to it, but it has just been left to rot,” Mr England said. “It’s a mess, an absolute mess, and it makes me so sad because the people living in the new Stoke Park estate don’t know the history of where they live. I virtually grew up in Stoke Park, but it’s still like a lucky dip bag for me when I come here. I’ve been coming here for 40 years but I still don’t know what I’m going to find next. This entry was posted in Bristol Post Weekly Column, News and tagged ancient woodland, Beaufort, Berkeley, Bristol, Bristol history, Bristol Post, Charles Somerset, Dower House, history, Matilda's Tomb, Steve England, Stoke Park. Bookmark the permalink.